Watching this sunset from this spot was not part of the agenda. While still in Hanoi, we had booked a ferry/bus combo from Ha Long Bay out to Cat Ba island. 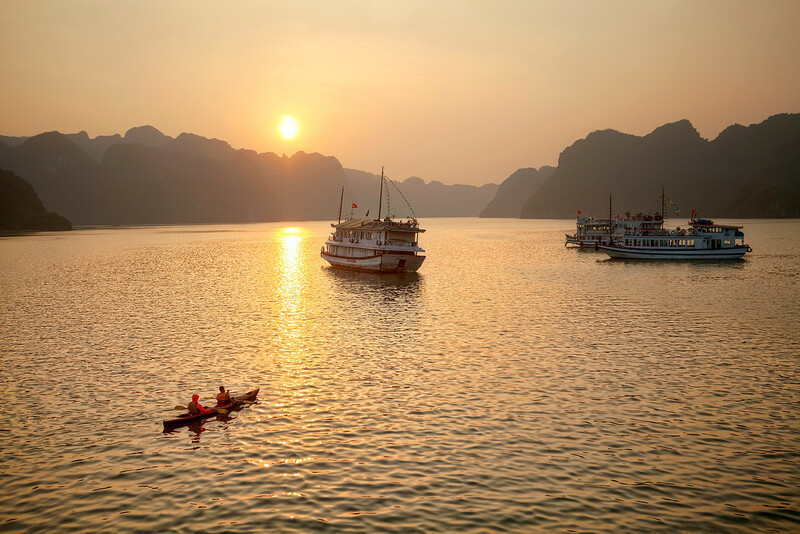 We had decided to bi-pass Ha Long Bay for the less trafficked but similar Cat Ba island. I’m normally pretty good at avoiding getting ripped off when travelling, but this time we fell into a bit of a trap. We were promised a direct boat trip to the island, as we wanted to get there and be able to explore at our own pace. Instead, after getting to the port we discovered that we were being bundled onto a tour boat, which made numerous stops. The hour long trip was going to take us a whopping 8 hours! We weren’t the only people to fall into this trap as there were about 6 others who were also stuck on this boat unintentionally. The worst part was, as we’d paid for a transport and not a tour, when they gathered everyone together to tell them what the plan was, we discovered that there was going to be food served, but there was none for us. As we thought we were on a 1 hour boat ride, we had no food with us at all, and we were already hungry! So, when I look at this beautiful sunset I can’t help but feel a little bitter about the fact that I was starving, captive, and miserable. It got worse though, once we got to the island we needed a bus to take us to the main area. Our bus arrived, we boarded it and it promptly broke down. Cue another hour wait for another bus to arrive! After yesterday’s difficulty getting inspired to process any photos I came home over my lunch-break and decided to work on a photo that I’ve attempted and failed at a few times in the past. Finally, I think I’ve cracked it. Incidentally, does anyone know what the flowers in this photo are called? This is another photo from the Paradis Malihide. Rising early, in the hopes of capturing the sun as it peeked over the horizon, I discovered that it was, once again, completely overcast. I never figured out where the sun rose and where it set while there because the cloud cover was so thick. Nonetheless, it was still a beautiful spot and I wasn’t going to let the clouds stop me. So, I went in search of photos where the sky didn’t have to be a prominent feature. I came across this scene and thought it was a great subject for HDR. 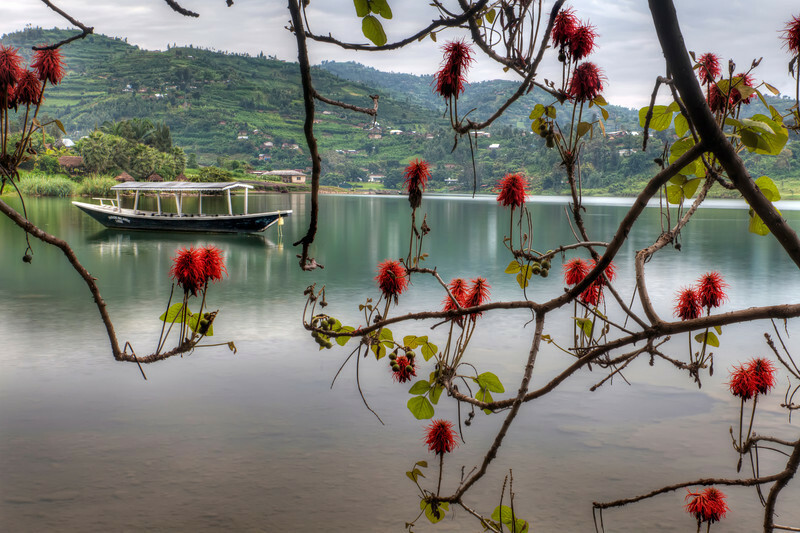 It’s almost like two images, allowing your eye to wander over the flowers in the foreground before moving on to look at the boat and the hills in the distance. People would arrive on package tours and pile into this little boat to cruise off down the lake. It was amazing how many people they stuffed into this thing. It was an interesting contrast watching the tourists in their bright orange life-jackets motoring back in for a nice dinner while the fishermen in dark rain jackets, t-shirts or shirtless plied their oars and sang their songs on their way for another chilly, wet night out on the lake. I’m not a package tour person, probably because I don’t like being herded around. We spend enough time in our working lives getting told what to do. Why go off on holiday and do the same? I met a couple of Californian guys while in Prague who had embraced this concept. They’d decided they needed a break and managed to negotiate three weeks off – supposedly no easy feat in the US – to head for Europe. When I ran into them all they had planned was their flight home from Amsterdam. I spent about an hour eating lunch with them as they tried to figure out their next destination. They’d narrowed it down to Germany when I arrived, and hadn’t gotten much further when I eventually left. Once I ran into them later, at about 9pm, it was sorted. They were leaving at 6am on their way to Hanover. It’s a great way to travel, waking up in one place, not knowing where you’ll be the next day.